Are you ready to get instant access to all the online tools your business needs for effective credit risk management? To know your customer is to know your future. With pbVerify, you now have 24/7 access to current Consumer and Business credit information. 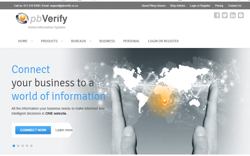 Whether you need to verify the identities of consumers, do background credit checks on consumers and/or businesses, verify company and director registration detail, verify VAT registrations, verify Deeds information on properties or need to do pre-employment and academic background verifications, pbVerify does it all. Renowned information systems company, Pitney Bowes SA, is proud to launch pbVerify – an all-new website platform that gives you instant, 100% free access to the popular pbVerify business risk management system. A simple, easy –to-use, yet effective web-based system for any size company. Our online personal credit report system, MypbVerify gives you access to your latest personal credit report and CompuScore which can be customised to include different information, depending on the info you’re looking for. These reports include detailed information about your credit history, account payments, loans, credit bureau adverse listings, judgements and fraud indicators. The premium report also includes all your directorships at CIPC and detailed deeds information on properties you own. Not only does pbVerify offer all the online credit risk management tools you will ever need, we now also offer specialised office software solutions to effectively manage the workflow and documents in your business. Our Electronic document management systems, digital signature solutions and electronic forms solutions will change the way you do business by removing inefficiencies and introducing effective workflow that will immediately be visible in your bottom line profits and service delivery. We know this is a lot of information to process, so its best that you browse through our new website located at www.pbverify.co.za to find out how we can help you. You can also, follow us on Twitter and Like us on Facebook to stay updated with all the news and new solutions here at pbVerify.